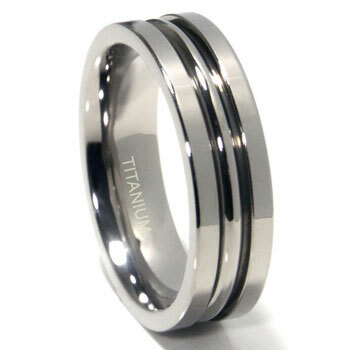 For sale is a very handsome men's wedding ring the TitaniumKay titanium 7mm high polish ribbed wedding band. The men's ring is built from grey high polish grade 2 titanium which has two grooves running parallel along the surface of the ring. The ring is 7 millimeters wide and is crafted from titanium which will ensure the ring will last a lifetime and more. Titanium is stronger than the precious metals, gold, platinum, silver, and other metals used for making rings. Men like wearing strong jewelry and titanium solves this requirement. As you may know it is also more durable than any other materials used for making men's wedding rings. Titanium is also 100% hypoallergenic so it is safe for anyone to wear as there will never be any green finger once it is worn. Be sure to shop our full line of titanium wedding bands. It's a beautiful ring. The edges are a bit rough- a bit too rough for me to sleep in but other than that, you wouldn't notice! It's comfortable, lightweight and OH SO PRETTY! love it! Would buy again.